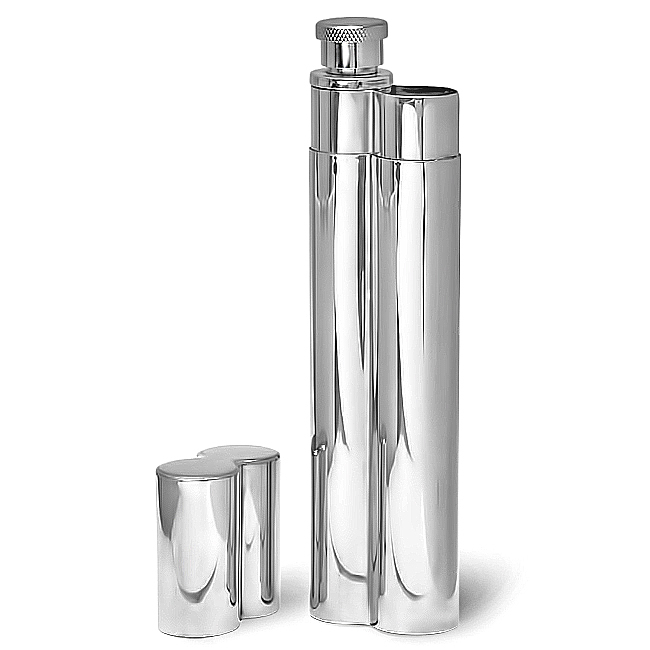 FEATURES/SPECS This sleek and stylish polished steel cigar holder and liquor flask from the Executive Gift Shoppe is a party waiting to happen. 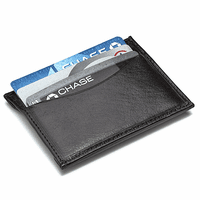 This combo features a slim and elegant double holder with one half used for a cigar and one half reserved for up to two ounces of your favorite beverage. 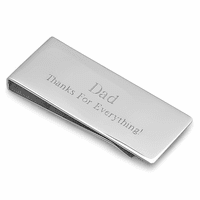 Add a special personal touch with the engraving of a name or initials of your choice at no extra charge. 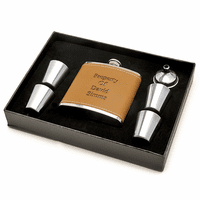 This flask and cigar holder combo comes packaged in a gift shop, ideal for groomsmen gifts and bachelor party gifts. Dimensions: 7 1/2" x 1 3/4"
Yes, absolutely. We could have htem shipped within 2 business days. You can place your order on our website. In the comments section of our checkut page, let us know that you are adding a logo to this item. Then you can reply to your order confirmation email with the logo. Here is a link to a page on our site describing the format we'll need for the logo: http://executivegiftshoppe.com/logos.html Please let me know if you have any questions at all. Thank you! (Add A Funnel $2.50) What is a funnel? Absolutely. If you order them Wednesday, they would ship Thursday so you would just need to go with UPS Next Day Air as your shipping method. Please let us know if you have any questions. On this two-tube item, I'd like one line (tube) to be engraved with initials ('ABC' for example), and the second line (tube) to be engraved with a date ('10-4-2014' for example). Is that possible? Yes, it is. Just let us know in the comments section that you would like the second tube engraved with the date, and specify what that date is. Please let us know if you have any questions. Do you offer any free shipping on large orders I am looking to get 10 or 11 of these? Thank You. Absolutely, all orders over 25 dollars qualify for free USPS First Class Mail shipping. However, orders over 75 dollars qualify for free UPS Ground or Priority Mail shipping. UPS Ground shipping should be perfect for you and would be free of charge. 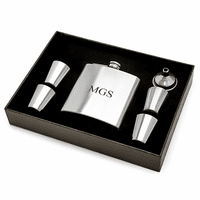 We manufacture this flask & cigar holder ourselves. It is a fairly new item, so we haven't generated any reviews. We will send this question out to our other customers that have purchased this item and see if they can offer their opinion. This flask definitely met up to my expectation. A lot of people dont carry large bulky flasks anymore and this is a fitting replacement, it was bought as a Fathers Day gift and my Dad always tells me how nice it is to have a couple shots with his favorite cigar. I would recommend this product, especially for the price. Sure, you'll just need to add each one individually to the shopping cart and then hit the Keep Shopping button. So, add the first one with its engraving instructions to the shopping cart. Then hit the keep shopping button and you'll be able to add the second one, with its engraving instructions. Keep doing this until all ten are in the shopping cart and you'll be able to check out as one order. How large of a cigar will the Cigar Holder and Liquor Flask combo hold? Ring gage? Length? We're not sure of the gage, but the cigar holder has a diameter of 3/4" circumference and is 6" deep. Hope that helps! A ring is 1/64" of a diameter. Multiply the .75" x 64 to get 48 ring gauge. We purchased these for our groomsman and fathers and everyone absolutely loved them. They are very unique and i love the fact we could personalize them. This was a great present for my groomsmen! Probably need the funnel but it was a hit and I was told "You set the bar high for the next weddings". The flask/cigar combo is awesome! The only problem I have with it is the engraving. It was very hard to actually see and rather small. You have to hold it under a light to actually even tell it was engraved. It's a nice piece, people always ask where did I get it, the engraving is a plus. Great gift as a "give a way"
I had NO idea what to get someone who is helpful to the office; this was serendipity. Note: If you do some shopping around then you can find it cheaper. ProsShipped and received quickly. Inexpensive(ish). Free engraving. Unique. ConsMade in China (usually not a big deal, but if you want to buy for the US Gov't it has to be made in the USA). I purchased 10 of these as gifts for a "Men's Day" I put together for friends. They were well recieved by the guests.